This body lotion incorporates the finest ingredients to renew your delicate skin. Butter yellow lotion with the scent of Lavender, Lemon and Vanilla. Shea Butter is extracted from the pit of the fruit that grows wild in Central Africa. 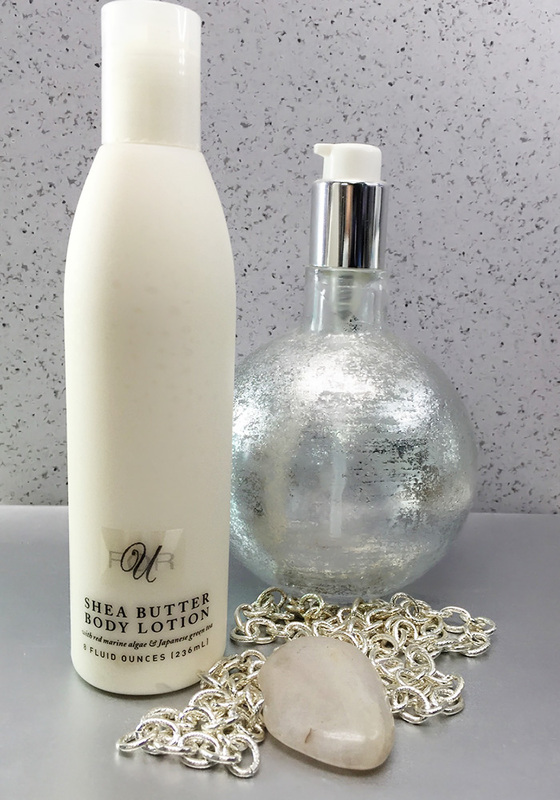 The benefits of Shea Butter are healing, protecting and moisturizing. You will experience increased hydration levels to calm irritated skin. Botanicals, Peptides and Hawaiian Red Marine Algae provide skin firmness, skin thickness and also repair damaged skin. The powerful anti-oxidant Japanese Green Tea Extract is known for its anti-irritant properties, which prevent redness, rough skin and peeling caused by sun-drenched skin or harsh weather. Vitamin E another anti-oxidant, adds to this unique formula by helping protect the skin from free radical damage. For all skin types. Apply all over body to maintain soft, smooth skin. Can be applied to the lips for extra hydration. Recommended use twice daily. Shea Butter -- Extracted from the Shea Tree, Butyrosperum Parkii grows wild in Central Africa. Known for the protective properties from harsh environment such as the hot sun and hydration from loss of moisture. Soybean Oil -- Extract from soybeans. Composed mostly of triglycerides of Oleic, Linoleic and Linolenic Acids. Rich in Tocopheryl, the prime source of Vitamin E.
Peptides -- Naturally derived plant ingredient. A short chain of amino acids. In the body, peptides regulate the activity of other molecules such as proteins to help repair and condition the skin. Red Marine Algae -- Bio-fermentation Red Marine Algae from Hawaiian Islands. Improves moisturization, reduction of fine lines, increases skin firmness and elasticity and increases cell turnover. Japanese Green Tea Extract -- Anti-oxidant, anti-inflammatory properties.